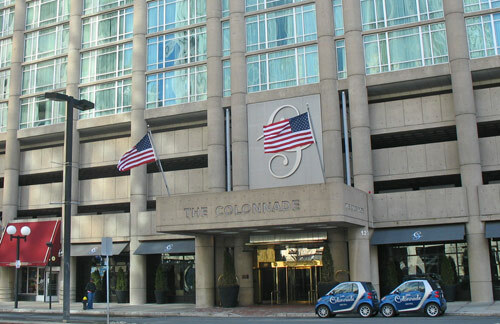 The luxurious Colonnade Hotel Boston, a sleek and sophisticated Back Bay hotel on Huntington Avenue near Prudential Center, features the city's only rooftop pool. The Colonnade stands out among Boston luxury hotels by catering to business and affluent travelers who love its elegant public spaces and comfortable, modern guest rooms. Even better, the Colonnade's location offers convenient access to Back Bay business locations, historic sites, and fabulous Newbury Street shopping. 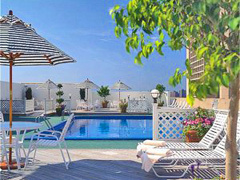 The Colonnade Hotel Boston's rooftop pool, eleven stories up, gives the feel of a glamorous beach resort, especially when the hotel's concert series featuring cutting-edge bands and performers from around the world is underway. Open between Memorial Day and Labor Day, weather permitting, the pool is one of the luxury touches that makes this one of the favorite Boston Back Bay hotels among return travelers. Inside, a recently completed $20 million renovation added additional polish to the already stylish Boston Back Bay hotel. 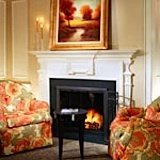 When you see the sophisticated taupes, creams, and chocolate browns mixed with black leather and blond woods in both public spaces and guest rooms, you'll understand why fans call this one of the best Boston hotels. 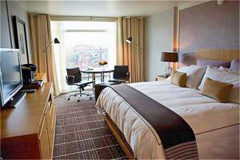 Colonnade Hotel Boston's 285 large rooms and 9 suites offer luxurious comfort. You'll enjoy down comforters, silky linens, marble baths, large flat panel TVs, DVD players, and MP3 iPod/iPhone docking station alarm clocks. Floor to ceiling sound-proof windows embody the ultimate touch of luxury: they open! You can breathe fresh air. A 1,000 square foot fitness room provides you with everything you'll need to stay in shape, while the 24 hour business center underscores why this is a favorite business hotel. 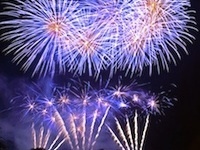 Boston business travelers also appreciate the totally soundproof rooms. 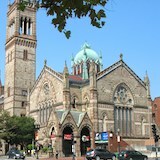 Directly across Huntington Avenue is Prudential Center, as well as the Prudential stop on the subway's Green Line. Copley Plaza, Downtown Boston, the Theatre District, the Hynes Convention Center, and Newbury Street shopping are just a few blocks away away. Although the Colonnade Hotel does not usually get mentioned on lists of Boston hotels near Fenway Park, it's actually quite an excellent option due to being only a 10-12 minutes away by foot. And just 2 blocks behind the Colonnade Hotel is the gorgeous Southwest Corridor park. Beyond that, you'll find Boston's beautiful South End neighborhood filled with street after street of meticulously restored Victorian brownstones.